The final thing to do now that you’ve found the user’s latitude and longitude and told them where they are in a human readable format is to put all the data you’ve gathered onto a map. For me, the positives outweighed the negatives, so I went with the static map. sensor: Required; either true or false. This simply tells google whether or not we used a sensor to generate this maps’s position. For us, this will always be true. size: Very simple, just width, an ‘x’, and then height in pixels. zoom: How zoomed in you are. 15 gives you a pretty zoomed in map. maptype: For us, a roadmap is what we want. You can also choose satellite or terrain, the same as if you were using the Google Maps site. mobile: Setting this to true allegedly gives you slightly simplified maps that have a lower weight. center: Finally, where the centre of our maps should be. Simple. Put it all together and you get something a little like this. But, that’s a bit boring. Normal Google Maps let you add all sorts of custom icons. 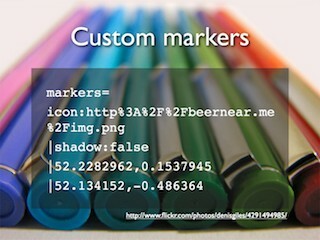 Well, we can do that too, by adding one or more markers parameters to the image URL. So, to add three icons to a map, two of them the same and the third different, you’d add something like the following to the above URL. And that’s all there is to it. After you whack a load of markers onto the URL you’ll end up with something like the Tottenham Court Road on Beer Near Me, where you can see, amongst all the other drinking establishments, The Bricklayers Arms – the home of Pub Standards (the middle thursday of every month – tell your friends). You might also notice on that page that if you click or tap on any of the icons on the map that you end with a popup telling you about the place. But how is this possible? 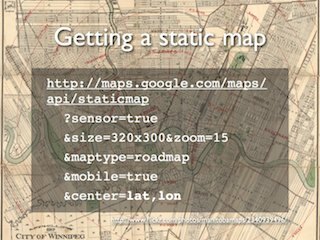 Aren’t we using Google’s Static map API? Of course, if we just did that then all the clickable areas on the map would be dumped up in the top right of the map, and no-one would be happy. So, we need to work out where to put those top and left directives. Now, it turns out that if you’re zoomed in to a Google zoom of 15 then each pixel equates to roughly 0.0000266667 units of latitude and 0.0000421875 units of longitude. So, we can use this to work out where we’d like to position our clickable elements. You have created a map that is 320 pixels wide and 300 pixels high, and zoomed to a level of 15. The centre of this map is at 51.510953,-0.133012. A public drinking establishment (De Hems) exists at 51.512081,-0.131288. Assuming a 30×30 clickable area with its centre at De Hem’s location, what should the top and left co-ordinates of the clickable area be? On Beer Near Me, I work out the numbers using some code that looks something like the following. Unsurprisingly, there’s something remarkably similar for longitudes. (If you’re wondering, the answer was top: 93px; left: 185px;). And that’s essentially that. What started as a simple weekend project to learn how to use the navigator.geolocation API ballooned slightly to encompass Google’s local search API and static maps APIs, and I ended up with something slightly useful. Maybe in a year or two I’ll have even made it pretty. hi sir, I want to create a simply app where by simply giving my current location with some key word say “hospital”.The result will show the nearby hospital in map along with path.But i am not able to achieve my expected result Could you suggest me which API’S, i would use to achieve so.